Paul’s statement beautifully highlights the role of effective inventory management in driving businesses’ success. Do it right and your business might do well but do it wrong your businesses will surely fail. Inventory management is not an easy task, let alone managing inventory with sales happening over multiple channels (including physical stores, e-commerce store, online marketplaces, etc.). To add to that, businesses have to meet the growing demand for improved shopping experience (same day delivery, timely updates, flexibility to buy online and pickup in store, etc.) from customers. Being able to exercise complete control over the inventory is every businesses’ dream, and there lies the solution to all the inventory management challenges. 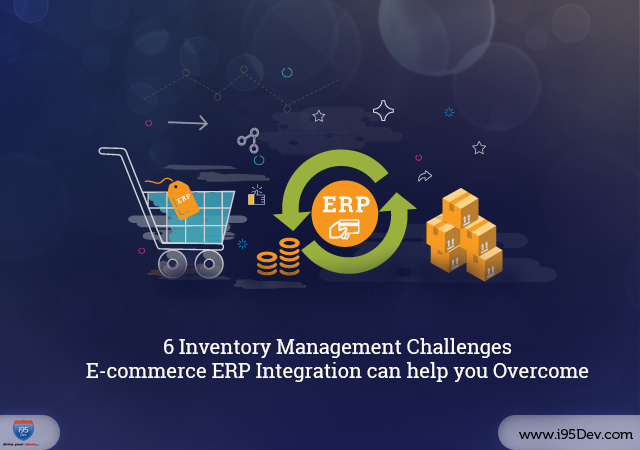 Let us quickly review the top 6 inventory management challenges that businesses frequently encounter and how e-commerce and ERP integration can help you overcome these challenges. Starks sold school supplies across the country from the chain of company owned physical stores. They were well known for the quality of their goods and amazing service. A year ago, they adopted e-commerce store to cater to customers who have been slowing moving online. Their e-commerce marketing efforts worked and the orders slowly started to trickle in. Starks’ invested more on their marketing efforts and offered amazing discounts. Thanks to which, their e-commerce order volume dramatically increased. But Starks’ happiness was short-lived. Starks’ soon realized they did not have enough inventory to fulfill all orders. While the initial few orders were shipped on time and the customers were extremely happy, others had to wait for the inventory to arrive. The delayed shipping had a huge negative impact on the customer experience. How E-commerce and ERP Integration can Help? With e-commerce and ERP integration, Starks can automate order sync from e-commerce to ERP and inventory sync from ERP to e-commerce. This will ensure that their e-commerce system (and ERP system) always has accurate inventory count for all products, hence preempting overselling of products. The Starks were quick to catch up on trends and added eBay and Amazon marketplaces to their sales channels. The platforms lived up to their expectation and drove a lot of orders. However, fulfilling these orders had its own challenges. eBay and Amazon had stringent requirements (like minimal order cancellations from vendor, timely fulfillment of orders, keeping customers informed about order and shipping status, etc.) which if not met meant Starks stand to lose more than they would gain. Starks worst nightmare was about to come to life. Despite sitting on a pile of orders, Starks either delayed fulfillment because of lack of inventory or had to cancel orders. Even for orders that were fulfilled, customers had little clarity about their order or shipping status. All this made eBay and Amazon unviable for their business. E-commerce and ERP integration does not directly address this challenge. However, it sets up the base for addressing it effectively. E-commerce and ERP integration, as discussed above, ensures accurate inventory information across systems (e-commerce and ERP) and timely fulfillment of orders while keeping customers informed about their order and shipping status. This setup and its benefits are extendable to eBay/ Amazon by integrating them with the e-commerce store. Which can then make selling on eBay and Amazon a breeze – accurate inventory information can greatly reduce order cancellation, automated order sync can lead to timely order fulfillment, and order and shipping status sync can drive customer satisfaction. As Starks sat down to measure sales across stores and channels, they realized a few of their stores were not doing very well. A quick analysis revealed that these stores were sitting on a lot of idle stock while so many e-commerce orders were aging because of lack of inventory. Starks struggled to find a way to avoid such situations and use inventory more effectively. E-commerce and ERP integration, by centralizing inventory and other information, can help Starks gain a complete understanding of their business. Their ERP system will be the single version of the truth, which will ensure they have an accurate picture of the inventory on hand. This will make it easy for Starks to embrace modern selling and fulfillment strategy like Buy Online and Pickup in Store to churn inventory faster (utilizing the idle inventory). The inventory management challenges for Starks were not limited the frontend sales channels. Because of lack of order sync between sales channels and the ERP system, Starks’ ERP system had incorrect information related to inventory on hand. This made it extremely difficult for them to identify when the inventory levels for a particular product went below their internal threshold. Because of which, they could not raise purchase orders, for stock replenishment, on time. This further delayed their already slow order fulfillment process. E-commerce and ERP integration, by automating order sync from e-commerce to ERP, can help Starks get an accurate view of their inventory on hand (even before the fulfillment process begins). Armed with this information, Starks can now raise purchase orders on time, as the inventory reaches closer to their internal threshold levels. Further, they can even automate this process (raising purchase orders) eliminating the need for manual intervention; further driving the operational efficiency in their business. Selling across multiple channels was a strategic decision made by Starks. While this helped drive sales all year round, the focus always was to extract the most from their Back to School campaign. This one campaign, which lasted for a month, contributed nearly 20% of their annual sales. However, what Starks were not prepared for was their strategy to sell specific products on specific channels and the increased order flow. To complicate things further, Starks introduced a new product; the inventory for which was stocked not based on their past data but on the gut. E-commerce and ERP integration is what lies between Starks and their ability to take data-backed decisions. With the centralized customer, order, and inventory information, Starks can better forecast their sales (by identifying trends) and stock inventory accordingly. Starks can further leverage this data to draw actionable insights like top sellers, product sales by channel, etc. This information can then be leveraged to build and drive effective marketing and promotional strategies, for both existing and new products. Further, insights from these can also be leveraged to validate strategic and investment decisions like drop shipping. Wait! Didn’t the title say 6 challenges? Yes, it did. And no we have not forgotten it. The reason why we have not mentioned the sixth challenge along with others is because the sixth challenge is a derived challenge – all 5 challenges contribute and aggravate the sixth challenge. Do you identify yourself with the Starks? If yes, contact i95Dev. We can help you go multichannel and scale your business effectively and efficiently.